I have been working on a new watch for about a year now. I wanted to make a new Nixie watch in a smaller case with more features. I realized that I could only make it small enough to suit my wife's wrist if I got rid of the large battery and 1 of the tubes. The immediate problem was then that I had to use a rechargeable battery as they are smaller in size. I didn't want to design something that needs to be charged by connecting a cable and charger to the watch. I modified my current Cold War nixie watch with 1 solar panel and a small lipo battery. This had a low charge current so I decided to take 2 panels rather than 1. I walked around with that for a couple of months and was convinced it would be the way to go. I then designed a new case to hold a new electronic module that had 1 tube and 2 solar panels. I wasn't too sure at that time if it would actually be convenient to read, but thought it would be ok, so went with the idea. As the watch would loose it's decorative feature (the battery sticker), I thought of something that would be a good alternative. The left and right hand side of the watch have some recessions that hold tiny disc magnets. An insert can be put here and held in place by the magnetic force. This insert can be decorated with for example nail polish to give it any colour you like. Nail polish is cheap and comes in many varieties (including glow-in-the-dark ones), so that is quite cool. Thinking about this idea, I actually thought it would be clever enough to get a patent on it, and so I did! After designing the electronic nixie module, I didn't see any reason why not making an LED module as well, so I made 2 modules for this case, 1 Nixie module and 1 LED module. The case is hard anodized aluminium with a stainless steel base. The glass is a strong 1.5mm thick AR coated scratch resistant Sapphire crystal. It is probably the only LED watch with a real sapphire crystal?? The battery is a 180mAh Lipo battery. Under normal usage (say 50 readings per day), a fully charged battery will last for about 6 months (without any charge current)!! To keep the battery charged, you need about 10 minutes of direct sunlight for each day you wear the watch. It is not recommended to just throw your watch in the midday sunshine for a couple of hours as the Lipos do not like to be charged over 45 degrees centigrade. So just pick the morning or late afternoon sun rays or charge your watch outside during lunch break while wearing it. The wrist will act as a heat sink while wearing the watch, so the battery won't overheat so quickly. The solar panels have 3 functions, they charge the battery, they measure the ambient light to set the tube brightness and they take over the function of the Cold War motion sensor. So similar to the Cold War nixie watch, this watch can also be activated through motion although electronically in a very different way. 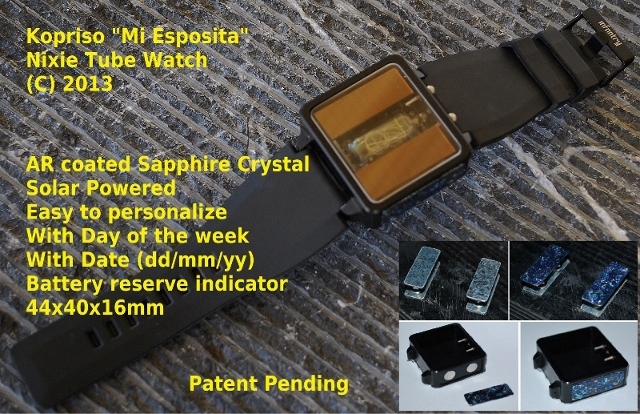 Extra features of the Mi Esposita watch are: Day of the week indicator; full calendar date (dd/mm/yy); battery reserve indicator; battery full indicator. Wow, very nice..you don't stop amazing me..incredible work Michel. Congratulations pulling it off again. Thanks guys, yes a video will be coming soon. Well, I guess "soon" means "as soon as I have time"
Expected next week or so. Interesting design. I would want to see the video to see how practical it is. ronaldheld wrote: Interesting design. I would want to see the video to see how practical it is. It is more practical that you might think it is. I had the same doubts when designing it, but if you choose the pause between digits correctly, it is very convenient to read. 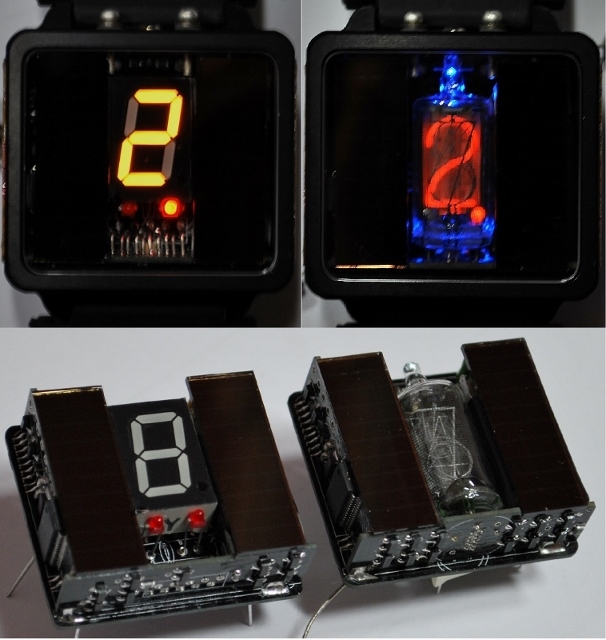 I really love the idea of a solar powered Nixie watch, and it looks neat too! 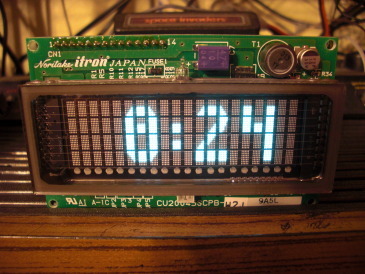 Have you considered making a watch with a Vaccum Flourescent Display? It's one of the vintage display techologies that would be neat retrofitted into a watch I think. Wow - awesome, very creative. I love the design. 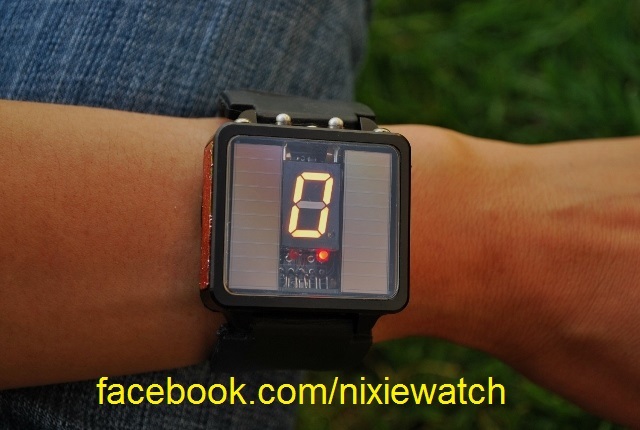 This could be considered as the very first practical nixie watch ever. Do you have plans for going into small scale production? I got 25 cases (20 black and 5 bare aluminium) and hope to have 25 modules by Christmas time. Perhaps 15 nixies and 10 LEDs. The nixies are more complicated to assemble and require much more testing time so the LED modules will for sure be a fair bit cheaper. Regarding the VFD, yes I have been thinking about that. I got some VFD's here. I think the main problem will be that they have heaters which means it takes a while to warm up before the display will do anything. For a clock this is not a problem, but for a watch it could be a bit annoying. I forgot to post this video here, so a bit later than promised but now I got 3 videos to share. 1st one explains a bit of the watch and functions, the other 2 is the LED and Nixie watch placed onto a rotary table for a 360 view.